Hands feel soft, even after washing. Johnson's® 24 Hour Moisture Hand Cream is a wonderfully soft balm designed to leave hands feeling soft even after washing. It combines skin conditioners, natural moisturiser, and softening oil - and soaks in to boost 24 hour hydration to help stop the 3 signs of dryness: reduce skin tightness, reduce skin roughness, and refresh dull looking hands. 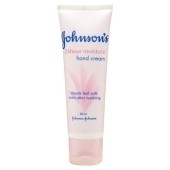 although not the richest hand cream money can buy it is excellent at providing vital moisturisation and protection. my hands stay soft and hydrated for hours after use and this tube is in my kit bag permanently. the fragrance is subtle and it absorbs rapidly without greasiness. the tube lasts for weeks on end with constant use so its excellent value for money. a real favourite for my young niece who just loves hand cream! Great price, soft and caring. I carry this around for my partner as she has eczema on her hands and this helps sooth them when they are flared up. Ease to use and great to carry about. Soft and works so well. Great hand cream to keep in handbag. A great little hand cream I use this as a daily regular hand cream as its a great price and its worth keeping in my hand bag. I like it mainly because it's hydrating enough for my hands and smells pure and light which I find help full when my husband or son needs to use some when were out and about. "great moisturisation but gentle on the budget "